When you think about cookies what are the first ones that come to mind? For me, one of my top favorite cookies is the chocolate chip cookie. Chocolate chip cookies are one of THE classic cookies most people enjoy. 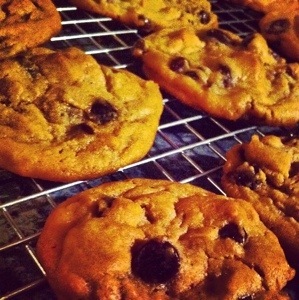 In honor or National Chocolate Chip Day I knew I had to post my go-to recipe for chocolate chip cookies. The recipe I prefer is not complicated, in fact my favorite recipe for chocolate chip cookies is the tried and true recipe printed on the back of Toll House chocolate chip bags. I’ve tried other recipes over the years, but for some reason this is the recipe that works the best for me, and my friends and family. the batch does yield a lot of cookies but I promise they will be such a hit there won’t be much leftover. Add nuts if you choose. I like to cover my cookie sheets with foil for easy cleanup. Halfway through the baking time rotate the cookie sheets from front to back, and also rotate sheets (if using more than one) from top to bottom racks.